Flaming June and the cherry tree outside the window is covered with nearly ripe. cherries. I am sure the birds have too! Long ago I made a deal with the birds. Leave me the raspberries and you can help yourself to any other fruit in the garden…. After all I can to go to the greengrocer or the supermarket to buy my fruit while they are left to fend for themselves and forage around for whatever they can find. With the birds residing in the garden I reckon they are their cherries just as much as mine. Regular readers of this blog will know that I am a great supporter of wildlife. While we humans encroach more and more onto the land it’s up to us to share the bounty from Planet Earth. Pasha & Tanni are all for supporting wild life but for slightly more suspicious reasons given half the chance….. The garden is lush and full of roses…..not long now till the summer solstice and the longest day of the year…..soon after follows Midsummers Day…. The Siamese dudes wake up early just as dawn breaks following the call from the wild from their ancestors down the centuries. Full scale play takes place often with the human bed becoming a racing track. Until they eventually collapse exhausted in a heap of tails and paws….. 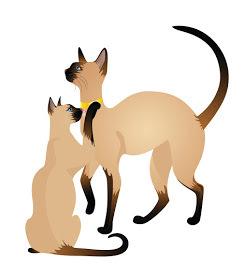 Check us out on Facebook and Like our page for regular updates on the Siamese Family! Two mischievous young Siamese Cats born on the same day these Crazy Cancerians are ruled by the Moon making them loving and affectionate. Pasha a caramel point and the eldest by just a few hours thinks this entitles him to the position of Top Cat. Tanni a chocolate point and a skilled hunter in the play department has no need for a fancy title. Saffi & Misa were two city Cats living in Brussels and London before moving to a picturesque village in the English countryside, running the household and keeping an eye on the local wildlife and feathered population. A rich cast of characters appear on the pages as a trail of furry and feathered creatures catch Saffi & Misa’s imagination, and invite comment on how strange humans can be. A good read guaranteed to bring a smile and lift the spirits! 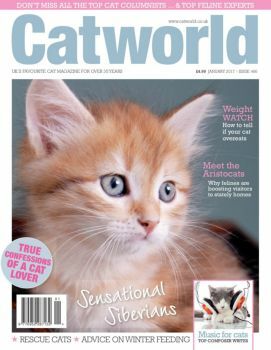 Read Pasha & Tanni's column and see their pics in the latest issue of Catworld Magazine. "Their blog reads really nicely" - Jill Mundy, Editor Catworld Magazine.